Being cool is dangerous. Cigarettes give cancer, juggling fire results in burns, and motorcycles are death-machines. Or at least that's what mom always said. 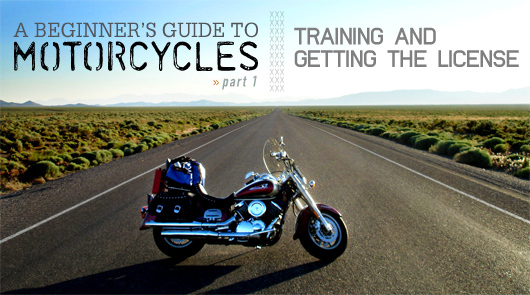 Turns out, getting started in the world of motorcycles isn't that hard or life threatening. Get the essentials for learning to ride and passing the test. So, you want to buy a motorcycle? Let's be honest. You want to ride a motorcycle because you think it's cool, right? Don't worry. This isn't where I say, “If you only want to ride a motorcycle because you think it's cool, then that means your head isn't in the right place and you should never get a bike.” On the contrary, I'd say a lot of people start riding initially because it's cool. Another appealing aspect of riding is the exclusivity of it. Heck, if most people rode motorcycles, I can almost guarantee you my main mode of transport would be a car (maybe). In the end, the best part of riding is the freedom. I think that's what the nods are for – an acknowledgment of the common understanding of the desire for freedom. Wow, that's deep. I'll start off by saying I'm not a professional and that this article is to act as a basic primer from one beginning rider to another. I'm not an authority in the motorcycle world and you should definitely do more research before purchasing your new set of wheels. That being said, you shouldn't just log on to a message board, browse a couple forums, or read an article online (like this one!) and take everything someone says as the gospel truth. A lot of riders are going to be talking from their own unique experiences, so just keep in mind that their stories and observations may or may not apply to you. Some will be providing advice from decades of cruising highways at 85mph on their Harleys. Their 50,000+ miles of riding experience sounds a lot different than advice coming from someone like me with less than a few thousand miles under my belt. Now that all those disclaimers are out of the way, let's get to it. You should weigh the pros and cons to help decide whether riding motorcycles is right for you. If you're reading this article, I'm assuming you already feel it's something you're interested in, but even if it's not and you're just toying with the idea, that's perfectly fine. Maybe this article will help push you in one direction or the other. The best way to find out, though, is get out and ride! Before the fun part, however, we must talk about the necessary part. So, you know you want to ride. Now what? Enroll in a local MSF course. The course instructors are super-friendly, patient and knowledgeable. If you're new to riding, this is a great, safe way to throw yourself into it. It usually takes place over the course of a weekend and consists of classroom instruction and hands-on riding instruction. Check out their website (www.msf-usa.org) and reserve a seat in a class. Some states cover the cost, in others the course could run from $100-$250 or more. Some insurance providers will reimburse you and/or give you a discount on your premium upon completion. The same applies to certain national motorcycle associations. Whether it's free or costs you, it's worth it. I've taken it a couple of times now – once when I first started riding and again a few years later as a refresher course.You may need to be 18 or over, but you don't need to be a licensed motorcyclist to enroll or participate in the course. In both classes I took, the experience levels of the participants ranged greatly. I saw beginners who had never even touched a motorcycle, a few with some experience, some who had stopped riding and were looking at getting back into the game, and veteran riders that just wanted to be reminded of the fundamentals. You take a written test at the end of the classroom portion and an on-course final exam at the end of the last day. Don't worry, though, all the exercises you'll be asked to do for the final exam are the same ones that you'll have just been practicing. There aren't any secret tips to passing the course, so just pay attention, be patient, and you'll do fine. Where you look, you go. I've seen dozens of videos online where people ride their bikes straight in to a wall or a tree or another rider. These unfortunate people would have definitely benefited from a MSF course! Viewers may call these beginner riders inexperienced or stupid and they may very well be correct, but I cannot help but acknowledge why it doesn't seem to be a rare occurrence. That reason is that when we're on our bikes, we tend to travel in the direction that we're looking. This is why someone would crash straight into the exact thing they want to get away from. All they're thinking is: “Tree. Gotta avoid the tree… Avoid the tree… Tree… TREE!” and then they crash right into to it. It's tough and may take some practice, but instead of fixating on the tree, you should look to where you want to go -not just with your eyes, but with your head, too, and your body will follow. Keep this in mind during your MSF course, especially for one of the final exercises you might have to perform called “The Box” where you need to manage two U-Turns, one after the other, within a small area. If you like speed, you know that feeling of “going fast” comes along when the objects around you start to blur. It could be said that “going fast” is simply travelling at a high enough velocity that your senses cannot process the activity in real-time. Perhaps it goes without saying, but this is unsafe because you've reached a speed at which you probably won't be able to react fast enough to avoid an obstacle – that is, if you even see it in the first place. Keep in mind that Time + Distance = Safety. The more seconds and feet you can place in between you and the car in front of you, the better off you'll be. If the driver in front of you slams on the brakes, having just a few extra seconds to react and/or just a few more feet of space to apply your brakes and start slowing down will help immensely. When you go to get your motorcycle license, just like for your driver's license, there is a written test and a hands-on skills test. 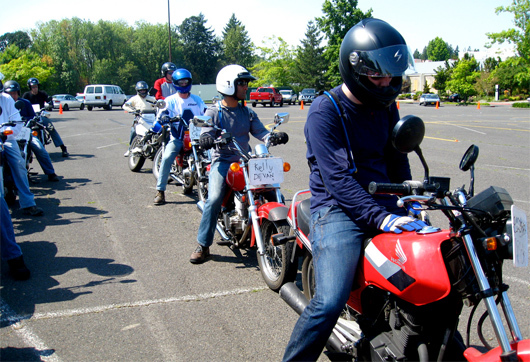 For the skills test, unless your DMV has motorcycles available on-hand for use (unlikely), you can bring your own bike or rent or borrow a bike from someone. If you took the MSF course, though, you have another option. Remember that certificate? Most DMV offices will let you use that certificate as a substitute for taking the skills test! They may need to see the certificate or you may receive a separate form from the course instructors that's specifically for the DMV. 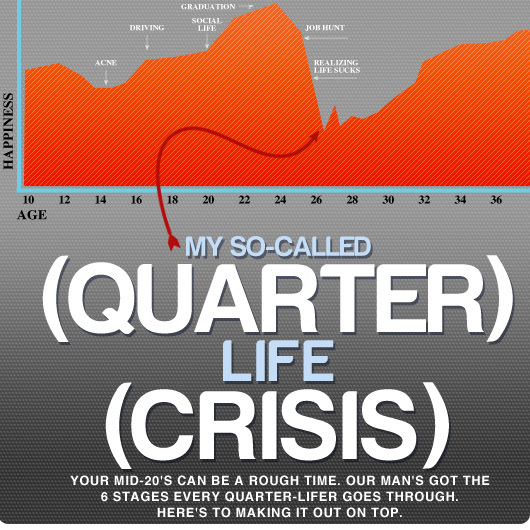 This is another reason taking the MSF course is a great idea. When you're ready, you would just take the written test and be on your way. In terms of the actual motorcycle license, odds are you won't have a separate license specifically for motorcycle riding. The DMV will probably just label your current driver's license with “M” or “M1” or “M Class” or something similar. Just so you know, in some states the M class will carry over should you move to a different state. In others, you may need to retest. Probably one of the most helpful tidbits of advice I can offer is: Read the handbook! I've met people who complain that they keep failing the written tests, but when asked if they've read the handbook, all they can say is how worthless that would be or that they already know everything. Apparently not! Even if you're already familiar with the traffic laws and parts of a motorcycle, it would benefit you to study the manual – even if only for a half hour or so. The test will most likely have at least a few questions that require very specific answers. Committing those facts, stats, and laws to memory will not only help you on the test but be good to have for when you actually start riding. Before you go in to take the test or even your MSF course, you can go into a local DMV and ask for the motorcycle handbook. No downside to looking it over ahead of time. One question that arises for some beginning riders is if there are different kinds of licenses that allow you to have passengers or not. You won't need a specific type of license to carry a passenger on your bike, but you do need a motorcycle that will seat a passenger safely. Sometimes it is obvious, for instance when there is a second seat or the primary seat extends far enough to seat another person. Other times there may be space, but the seating area is covered with a cowl or a fairing. If that's the case, you should not offer to give anyone a ride. There are some things to keep in mind before taking on a passenger. You're going to want to make sure you're familiar with your bike first and that you're comfortable with how your bike moves and all the controls before you consider giving someone a ride. Go ahead and ask your passenger what their experience with motorcycles is like. Have they ever ridden a bike before as a passenger or otherwise? This should help ensure they'll know how to position themselves correctly when seated behind you. Don't forget that with the added weight of a passenger, your bike will move differently. It will not accelerate as quickly and it will take longer for you to stop. Factor this into your following distance. You also may need to lean more or less to execute a proper turn. Overall safety is just as important for your passenger as it is or you, so he or she should be geared up just as much as you are. Should you take a spill, you want to make sure you're both fully protected. 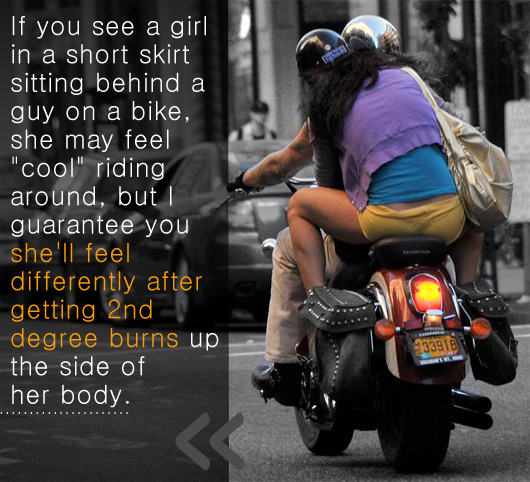 If you see a girl in a short skirt sitting behind a guy on a bike, she may feel “cool” riding around, but I guarantee you she'll feel differently after getting 2nd degree burns up the side the of her body. Stay tuned as we discuss the necessary gear, things to look for in a bike, handling dealerships, and finding good insurance in the weeks to come! what is the correct way to get on back of motorcycle? .-= Motorcycle´s last blog ..Motoren problem =-.